This 1-day slow sightseeing tour by car starts from Varna, Bulgaria and heads to the region of Silistra on the Danube River. You will visit Srebarna Nature Reserve and Lake Srebarna, the town of Silistra, known for its Turkish fort ,Abdul Medzhidi and the beautiful park alongside the Danube River, and finally the Old Dobrich Architectural -Ethnographic open-air museum. Your tour starts at 8:00am from your accommodation in Varna. The road passes through the beautiful Dobrudzha region. 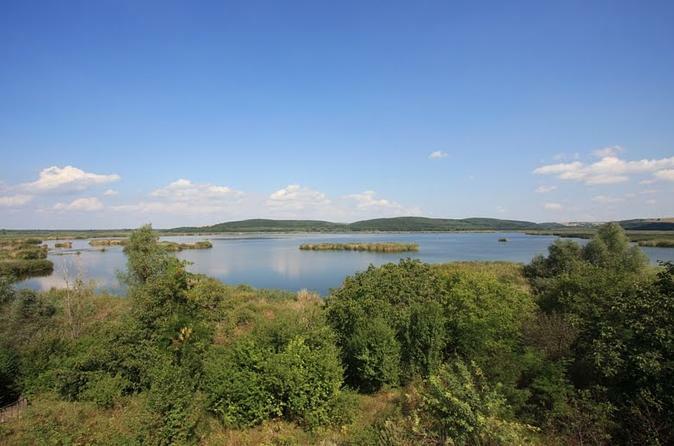 You will arrive at Srebarna Nature Reserve (about 140 km from Varna) at about 10:30. Start with a walking tour around Srebarna Lake and enjoy the pleasant view from the specially constructed observation platforms. After spending time with nature, you will continue to the Turkish fort Abdul Medzhidi, also called Medzhidi Tabiya, the only fortress with completely preserved interior and exterior belonging to the Ottoman period in Bulgaria. It was built because of the need to further strengthen the Danube cities, when the Danube River was established as a natural border of the Ottoman Empire. After the fortress, you will continue to the town of Silistra on Danube River, one of the first towns to set up their own museums in Bulgaria. The History Museum in the town was opened on 11 January 1899 and comprises two exhibitions – an archaeological and an ethnographical one, situated on different places. The ethnographical exhibition includes exhibits that present the way of life and the culture of the Dobrudzha people from the Silistra Region who lived in the period from the mid-19th century to the beginning of the 20th century. The archaeological exhibition comprises prehistoric, ancient and medieval monuments. You will have a stroll through the city center, visiting the Kurshumlu Mosque, built during the first decades of the 17th century by Ottoman architects. It is famous for its richly painted walls and ceilings and the colored stones used in the brickwork around the windows and the doors. In the afternoon you will enjoy the beautiful park and picturesque river panoramas alongside Danube River. On your way back to Varna, stop in the Old Dobrich Architectural-Ethnographic Museum, an open-air museum where the traditional crafts of the Dobrudzha Region since the end of the 19th century and the first half of the 20th century are preserved and exhibited. It is located in the center of modern-day Dobrich, taking the place of what was formerly known as Odun Market. Skilled craftsmen descending from families with traditions in craftsmanship continue the centuries-long tradition of their crafts at the reconstructed old town market. Potters, blacksmiths, embroiderers, weavers, coopers, goldsmiths, and others make traditional products using old techniques and ingenious tools in more than 30 workshops. At the end of the day, you will set off back to Varna and your accommodation, arriving around 8:00pm.